We have noticed a worrying trend among the WMTS services Spatineo is monitoring. Our monitoring is showing that the availability of WMTS services published with ArcGIS is really low. In fact, the availability level for the majority of these services is 0% or just barely above it. These services are provided by a variety of data providers and hosted on different servers, and furthermore other services served by the same ArcGIS servers are working very reliably, so we decided to investigate. In case you’re not familiar with WMTS, here’s some background information. WMTS services are meant to deliver rendered map images as predefined tiles that may be rendered beforehand and at the very least can be cached after rendering. Predefined tile boundaries and caching makes WMTS services very quick compared to for example WMS. For a client to be able to access the data, these services define what kind of tiles are available in the service. This information is called an image pyramid. 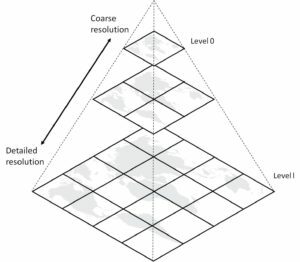 A pyramid defines multiple zoom levels (or resolutions) and the number of rows and columns of available tiles for each zoom level. 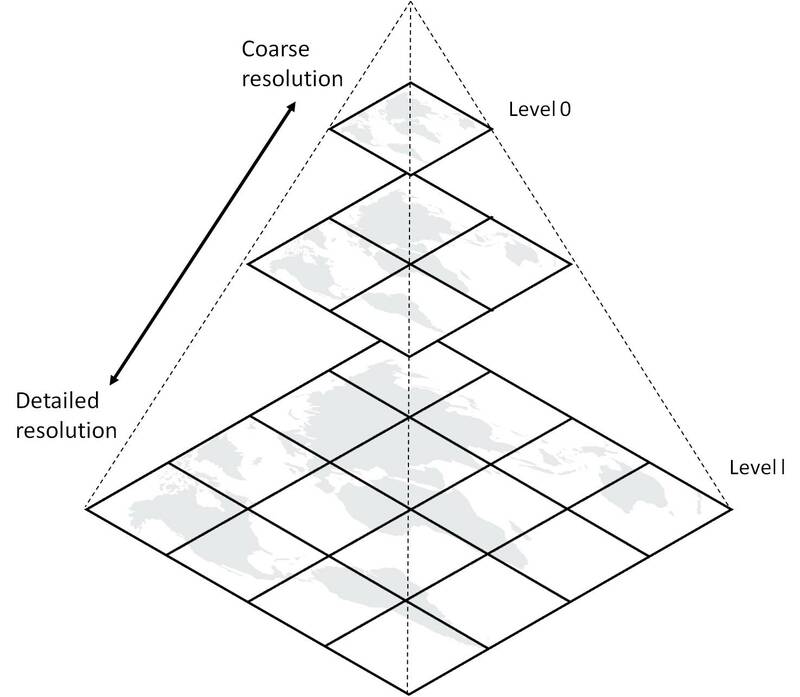 In WMTS, an image pyramid is called a tile matrix set and one zoom level is a tile matrix. Each tile matrix is defined to be valid at rows 0..matrixHeight-1 and at columns 0..matrixWidth-1. Server implementations often use the same tile matrix definition across different layers and even services as this makes it easier to access multiple layers from these sources. Especially these commonly used tile matrix sets tend to cover very big areas and thus, at high resolutions, a tile matrix may be made up of millions or even trillions of tiles. However, a single layer typically will not cover the entire area of the tile matrix set, so WMTS allows each layer to set up limits for each tile matrix. These limits set minimum and maximum bounds within each tile matrix. So while the entire matrix is valid at rows 0..matrixWidth-1, a layer may be limited to be valid only within minTileRow..maxTileRow, and similarly with columns. These limits play two important roles: to save resources on the server especially if the tiles are pre-generated, and to help clients focus on the relevant geographical areas where there is data available. ArcGIS WMTS services however, never publish any such limits in their service description. However, in reality there are limits within these services: ArcGIS does serve tiles for all tiles defined in the capabilities document. The WMTS specification states that “The normal response to a valid GetTile operation request SHALL be a tile map that complies with the requested parameters…” (8.2.3, KVP requests) or “In response to a valid request for a Tile representation from a client, a WMTS server SHALL send either an image representation of the tile or a reference to an image…” (10.2.3, RESTful requests). This is to say, if you request a tile which is within the tile matrix set and any defined limits, the server should always respond with an image, or at least a link to an image. Services we’ve analysed either define tile matrices that in reality are not available at all, or return data only for a relatively small area within each tile matrix. All analysed services misrepresent what tiles are available. Let’s take for example a service from ESRI Finland. You can see the capabilities document here. This service defines a single layer and a single tile matrix set and no tile matrix limits. According to the service description, the tile matrix set has 13 tile matrices (indexed 0..12). The tile matrix 12 is defined 17411 tiles wide and 10150 tall. According to WMTS the service should return a tile at tile matrix 12, row 0 and column 0. However, the service responds with a HTTP 404 (not found). This is contrary to how WMTS services are supposed to work. You can try the request yourself. This behaviour can cause unexpected failures in WMTS clients and it is also the reason why Spatineo’s monitoring shows such low numbers of availability for these services. We create varying monitoring requests based on the service description and analyze whether the service is responding according to the WMTS specification. Unfortunately, for most of the legal GetTile requests, these WMTS services published with ArcGIS do not respond correctly. Fortunately in ArcGIS, you can specify a custom Capabilities document for OGC services. You can do this by following their documentation. With this procedure it is possible to write a Capabilities document that specifies proper limits to the tile matrices and hide the zoom levels that are not available or useful for the service in question. Unfortunately modifying this XML document by hand can be tedious work. But before ArcGIS is fixed, there’s little more you can do if you want your service to interoperate well with WMTS clients. What is the status for ArcGIS Servers? Do they fixed the issue? We have developed a prototype tool to determine the real limits of ArcGIS WMTS servers. The tool creates a modified Capabilities document with these limits in place. Unfortunately ArcGIS Server does not allow administrators to replace Capabilities documents for WMTS services as easily as you can with WMS. If we could find a way to replace the server generated Capabilities document, then we’d have something that could fix the issue almost immediately.